The words sustainable and sustainability are thrown around a lot but the average person still has a hard time understanding exactly what these words mean and their impacts on society in general and agriculture in particular. I would like to help clarify sustainability as it relates to the wine industry and I want to initially analyze California wine production and identify the formal process for producing sustainable wine there. The most common certifying organizations for sustainability for the wine industry in California are Sustainability in Practice (SIP), Certified California Sustainable Winegrowing (CCSW), Napa Green, and Lodi Rules for Sustainable Winegrowing. Each organization has developed its own guidelines and certification process. Some wineries and winegrowers have chosen to seek multiple certifications from these bodies, as they are not mutually exclusive. Let’s take a closer look at each body and how they define (in their own words from their Websites) their certifications. 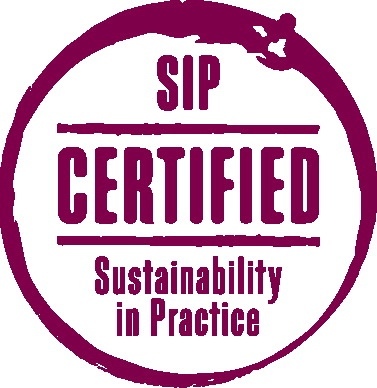 Sustainability in Practice (SIP) Certified is a rigorous sustainable vineyard and wine certification with strict, non-negotiable requirements. We are committed to standards based on science and expert input, independent verification, transparency, and absence of conflict of interest. We pride ourselves on the program’s rigor and integrity, which have earned SIP the reputation as being the gold standard for sustainable certification. It’s why we can offer you great wines and you can trust that they are made in a way that protects the people and the planet. SIP Certification is dedicated to the 3 P’s of Sustainability – People, Planet, Prosperity. We are committed to our ‘3 P’ approach, ensuring that both natural and human resources are protected, all of which means you can enjoy wine that has been grown for the greater good. We realize that how we farm impacts things beyond our fence line, so we independently verify and certify practices that protect our community, our workers, and our environment. •Social Responsibility – We offer competitive wages, medical insurance, training, and education because each worker is a valuable resource. •Water Conservation – We regularly monitor soils, plants, and weather, irrigating vines only when needed. •Clean Water – We keep water clean by growing grasses to reduce erosion and filter storm runoff. •Safe Pest Management – We introduce beneficial insects, attract raptors, and plant enriching cover crops to keep vineyards healthy. •Energy Efficiency – We minimize tractor use to reduce our carbon footprint, and use alternative fuels and energy sources like solar and wind. •Habitat – We create wildlife corridors to give animals access to traditional watering holes and food, helping to maintain biodiversity. •Third Party Audit – We verify adherence to SIP’s strict Standards through third party documentation and onsite inspections. •Improvement – We annually update and regularly peer review the farming Standards as Best Management Practices evolve with new science, technology and research. The Sustainable Winegrowing Program’s mission, vision and values best describe the combination of factors that motivated the California wine community to design, develop, implement and report on a comprehensive sustainability program. The vision of the Sustainable Winegrowing Program is the long-term sustainability of the California wine community. To place the concept of sustainability into the context of winegrowing, the program defines sustainable winegrowing as growing and winemaking practices that are sensitive to the environment (Environmentally Sound), responsive to the needs and interests of society-at-large (Socially Equitable), and are economically feasible to implement and maintain (Economically Feasible). The combination of these three principles is often referred to as the three “E‘s” of sustainability. These three overarching principles provide a general direction to pursue sustainability. However, these important principles need to be translated into the everyday operations of winegrowing and winemaking. To bridge this gap between general principles and daily decision-making, the Code of Sustainable Winegrowing Practices workbook’s 15 self-assessment chapters translate the sustainability principles into specific winegrowing and winemaking practices. the wine industry. Focused on environmentally sound, sustainable practices, Napa Green is a voluntary program that is third-party, independently certified and meets and exceeds 20 local, state and federal land or production best practices. Napa Valley wineries and growers participate in farm-specific plans tailored to protect and enhance the ecological quality of the Napa Valley, or in production facility programs that reduce energy, waste and water use for an overall goal of pollution reduction. • For every acre of vineyard land in Napa County, 1.47 acres of land are certified or pending certification in the Napa Green program. • More than 66,000 acres of land are enrolled in the program with more than 37,000 acres having been certified. • 18,900 of the certified acreage is vineyard land, which is more than 40% of the total vineyard acreage in Napa County (45,000 acres/18,200 hectares). • Independent certification is granted by the National Marine Fisheries Service, the Regional Water Quality Control Board and the Napa County Agriculture Commissioner. • A majority (90%) of the Napa River watershed is in private ownership and public/private partnerships making Napa Green vital to the sustainability of our community. • Nearly 5 million cases of wine are produced by Napa Green Certified Wineries each year. • Napa Green Certified Winery uses a set of sustainable and green business practices developed specifically for wineries. • Participants receive comprehensive energy, waste and water assessments for their facilities, ensuring that all operations are optimized for efficiency. • Certified wineries demonstrate a commitment to conserving water and energy, reducing waste and preventing pollution with the overall goal of reducing their carbon footprint. The Lodi Rules for Sustainable Winegrowing is California’s original sustainable viticulture certification program. Our certification process is rigorous, based in science, voluntary, and third-party audited. Lodi Rules certified growers make up an innovative community with a history and commitment to farming quality winegrapes through the implementation of viticulture practices that balance environmental, social, and economic goals. 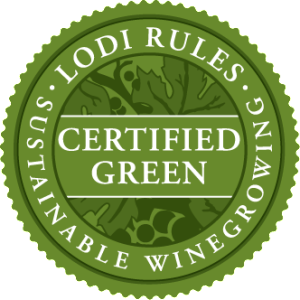 The Lodi Rules was designed to communicate our commitment to sustainable agriculture to wineries and the general public. The Lodi Rules has two key components. First, the Lodi Rules promotes winegrape grower adoption of 101 sustainability practices, which we term “standards”. The standards were collaboratively developed by a team of Lodi winegrape growers and viticulture professionals, and were accredited by Protected Harvest in 2005. The Lodi Rules standards are the backbone of the program, and are organized into six chapters: 1) business management; 2) human resource management; 3) ecosystem management; 4) soil management; 5) water management; and 6) pest management. The standards meet three criteria: first, they are measurable; second, they address at least one of the three aspects of sustainability (environmental health, social equity, and economic viability); and third, they are economically feasible to implement. We believe that the Lodi Rules standards are the most thoroughly and rigorously vetted set of sustainability practices in California’s viticulture industry. All standards have been peer reviewed by third-party scientists, members of the academic community, and environmental organizations. Certified growers are required to implement a minimum of standards. The second key component of the Lodi Rules is the Pesticide Environmental Assessment System (PEAS), which is unique to the Lodi Rules. PEAS is a model used to quantify the environmental and human impact of all pesticides applied in a vineyard. The PEAS model generates an Environmental Impact Unit (EIU) for each pesticide, which is based on the pesticide’s impact on: 1) acute risk to farm workers; 2) dietary risks from acute and chronic exposure to people who consume the product; 3) acute risks to small aquatic invertebrates; 4) acute risk to birds; and 5) acute risk to bees and pests’ natural enemies. Pesticide use by Lodi Rules certified growers must fall below a specified level of PEAS impact units. A vineyard qualifies for certification if it meets several criteria. First, growers accumulate points through implementing sustainability practices and must sum to at least 50% of the total points available in each chapter. Growers must accumulate at least 70% of the total points available across all six chapters. Implementation of some standards is mandatory. Such standards are those that the program designers believe are imperative for sustainability. Finally, the EIUs for the pesticides used in that vineyard for the given certification year cannot exceed a specified threshold. Certification is awarded to an individual vineyard on an annual basis. Certified vineyards must pass an annual independent audit to verify the implementation of sustainability practices. ~ by Thomas on November 1, 2015.